The much-maligned “bank tax” was a pivotal episode in the state’s recent political life, showcasing a bitter PR battle between business – led by Bank SA – and the former Labor government. The controversial measure to raise around $360 million over four years in new taxes on the major banks was outlined in Tom Koutsantonis’s final budget as Treasurer, in June 2017. Amid the business backlash, the deep and immediate impact on economic activity was articulated early by the Bank SA CEO Nick Reade, in an outraged opinion piece published in The Advertiser. “I can also tell you that the South Australian Government’s assault on our business will force us to reconsider plans for growth in the state,” Reade thundered. After dumping his budget centrepiece in November 2017, Koutsantonis wrote to Reade, challenging him to “provide details on the automated processing centre and the 150 jobs”. So did the automated processing centre ever actually eventuate? Well, emails addressing that very question have been flying to and fro over the past few days and we can definitively say that we’re not really sure. It probably depends on how you define an “automated processing centre” – which was, in hindsight, probably a point worth clarifying back at the debate’s zenith. Certainly, the impression created by Reade’s use of the phrase – “create a process automation hub in SA” – was that the bank planned to establish some new piece of infrastructure, an extra operation. This was certainly the impression conveyed across various media, including The Advertiser, which declared that “Bank SA says it will put on hold a plan to open a new backroom office in Adelaide” and later that the tax had forced it “to halt plans for 150 jobs at a new Adelaide office”. This interpretation was echoed by the Australian Financial Review (“BankSA and the broader Westpac Group have put on hold a plan to open a new back-end automated processing centre in Adelaide that would have created 150 jobs”), The Australian (“a plan to open a processing centre in the state that had been expected to generate 150 jobs”) and here at InDaily, which noted Labor’s “self-described ‘jobs budget’ has been blamed for the direct loss of 150 jobs, with Bank SA putting plans for a new automated processing centre in Adelaide on hold”. Over at FIVEaa, presenter David Penberthy, interviewing then-Opposition Leader Steven Marshall, noted that the bank had “cancelled a new call centre project that would have created 150 jobs”. The bank insists the 150 jobs were eventually created – pointing out a paid full-page advertisement that ran in The Advertiser in November 2017. “We are one of the largest employers in the state and we continue to look for opportunities to grow our local workforce and invest in the state,” they went on in a written statement. ⁦@BankSA⁩ is hiring in Retail and Business Banking. In response to the bank’s original statement, InDaily sought to clarify whether the 150+ jobs were indeed created as part of a “process automation hub” – and what exactly that is. “The term ‘process automation hub’”, we were told, “was used to describe a collection of new roles, capabilities and functions to be located in Adelaide”. “We’ve had a number of large processing hubs in SA for some 20 years, so the intent wasn’t for a new physical building, the intent was to bolster those existing hubs with over 150 new staff. We also sought to clarify whether this meant the bank now employed 150 more full-time-equivalent staff than it did in mid-2017, or whether branch closures have cancelled out the new hirings. The Australian reported in December 2017 that Westpac, which owns the Bank SA brand, “closed 35 branches in South Australia over the two years [from mid-2014 to mid-2016] — a decline of nearly 25 per cent”. “In terms of branch closures, I can confirm that BankSA redeployed all impacted employees,” a spokesperson said. So, we pondered, did Reade over-egg the proverbial pudding when he lamented the bank’s abandoned plans “to create a process automation hub in SA creating 150 jobs”? The bank insists he didn’t. “We committed to creating 150 jobs in SA in areas like Technology, Risk and Operations (including automation capability)… we have delivered on this commitment to create more than 150 opportunities for South Australians to work across the Group in several of our existing hubs,” the spokesperson said. “An example of new capability we introduced is the development of Artificial Intelligence here in Adelaide to support home lenders with the right knowledge to provide the most value for our customers. Labor’s Shadow Treasurer Stephen Mullighan – who in a separate media conference last month described banks in general as “easily the greediest members of the Australian community” – begs to differ. 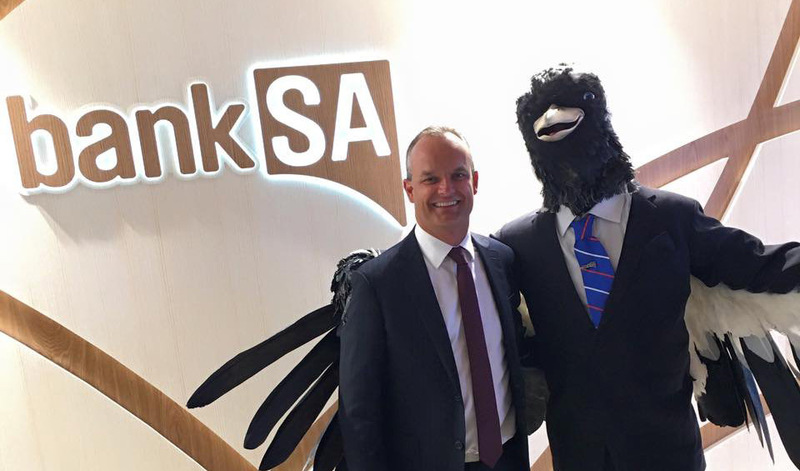 “South Australians were led to believe that BankSA would be creating a new processing facility [with] 150 jobs,” he told InDaily. “It’s clear the new facility hasn’t been delivered, and given the scale of branch closures by BankSA – and all of the ‘big four’ recently – it’s hard to believe any of these jobs have been created. Asked whether Labor still regarded the failed bank tax as good policy, Mullighan noted that “certainly the Federal Coalition Government decided that the banks needed to make a more substantial contribution to Australian taxpayers through the imposition of its own bank levy”.